Carbalt™ 3/32" square" x 2-3/8"
Note: These Carbalt blanks are not tapered. 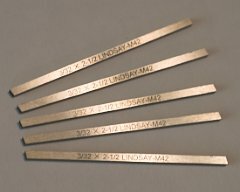 The various Lindsay sharpening templates have built in tapering facets which are used to bring the tip down to the desired size. A point can be shaped to a small tip using sharpening templates. A time saving option are the 3 variations of tapered Carbalt blanks offered below. Yet another option is the "Narrower" template ($8) which has customizable options to taper and thin a graver shank before sharpening. This is a presharpened carbalt graver with the 116 degree Uniform Parallel Point™ that will be sharpened using the Universal template. $23 each. Sold in packs of five. 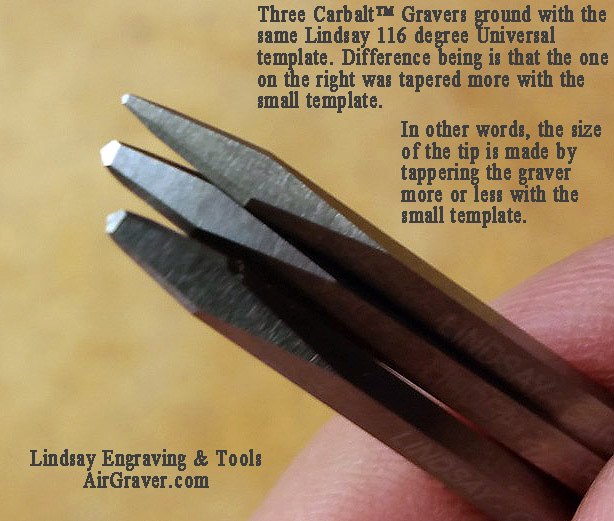 Note1: A micro tipped graver can be ground by slimily using the small template in the template sets to taper the graver down to the size desired. 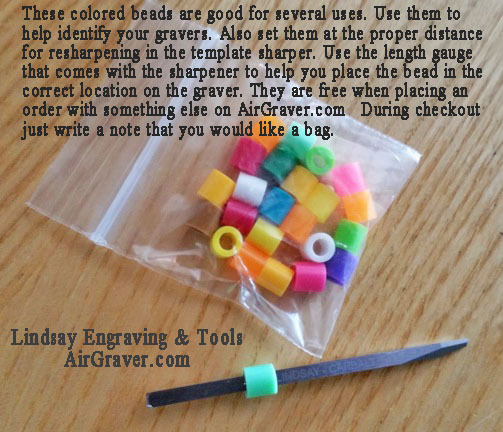 In other words these pre-ground tapered gravers are not needed to make a micro tipped point. What they do for you though is it means there is less bulk for you to remove while using the small template. Click photo to enlarge. Note2: The 3 degree or 2 degree taper is recommended over straight or 1 degree tapers. If new to engraving stick with the 3 degree to keep the rigidity in the shank while learning. The straight and 1 degree are for advanced engravers as they are delicate and can snap in half. There is no warranty on a snapped in half graver. Tapered shanked gravers are more durable. These are free when placing an order with something else on the website. During checkout just write a note that you would like a bag. Otherwise, they can be ordered by themselves below. 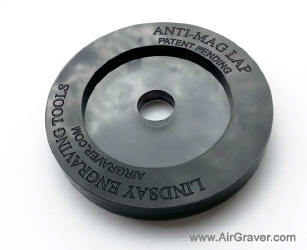 Spin this lap to demagnetize gravers or other small metal objects. To use, hold the object to be demagnetized close to the center of the spinning lap and pull the object straight away from the center. A long, thin shank can be useful, but there are drawbacks as well. The bright side is that there is less material to grind away when sharpening, and that the view is less obstructed when engraving. The disadvantage of a narrow shank is the lack of rigidity. An experienced engraver comes to realize that the object being engraved needs to be held securely in a vise to get the best results. If there is any recoil movement, things get difficult. The metal will seem to cut harder and more broken points will occur. The same principle applies to your cutter. When a long, thin graver is used with a power assisted graver, it will flex or vibrate with the result of power loss and more broken points. A thicker, shanked graver can make noticeably cleaner cuts than the same point on a long, slender shank when used in a power graver. That said, the effect is less pronounced when cutting fine lines. A means for having a balance of both rigidity and a small tip is a taper rectangle shaped shank (similar to a knife blade). The "Narrower" template works to grind such a shank accurately. Harder than HSS and holds a cutting edge longer while still maintaining good durability for less point breaking. Less expensive than Carbalt™XD. Harder than M42 and HSS. More durable than straight carbide gravers. Holds up in harder metals, stainless, gun and knife metals with stronger ground geometry. Cutting edge holds up longer than HSS or M42 without going dull. Engraving in brass, gold, silver, and platinum maintains a polished cut without galling. Cutting edge wears faster than does M42 or Carbalt™, thus requiring more frequent resharpening. When used to engrave in brass, gold, silver, and platinum, HSS does not cut as bright compared to Carbalt™ gravers. More expensive than HSS. Engraving in brass, gold, silver, and platinum do not cut as bright compared to cuts using Carbalt™. Most expensive. More likely to break than go dull. Not recommend for narrow fragile geometry ground points in harder metals. Good for making points that are narrow and fragile, such as undercut gold inlay gravers, narrow flats and Vs. In years past used by many engravers as an all around less expensive graver. Same as HSS but all around improvement in terms of holding an edge longer without becoming dull as easily as HSS. In harder metals Carbalt™ is great for stronger shaped geometry such as Lindsay Uniform-Parallel points, 96 degrees and wider. To increase strength of a point dub the face to effectively place a small steep face right at the tip. Points with weaker geometry can be used in softer metals such as gold, silver, copper, etc. Note: It has come to our attention that some inferior tool blanks are being offered by others. These blanks may be seriously undersized and therefore may not sharpen properly in the Lindsay sharpening system. It has been noted by some of our Lindsay tool users that they may wobble slightly in the holder, causing difficult cutting, especially of fine shade lines. 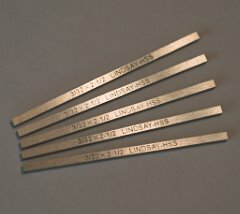 By contrast Lindsay blanks are manufactured to precise tolerances to within +- .001 inch of the 3/32 inch specifications. We must warn our users, to insure proper function of your Lindsay Sharpening system, and Lindsay air tools, be sure to use authentic Lindsay Carbalt™, M42 and High speed tool blanks. Accept no substitutes! Lindsay Carbalt™ has gotten even better. Lindsay Carbalt™ is more durable than the original plus they are longer. The gravers are fine-grain carbide and cobalt. The grade was developed in close collaboration with several carbide manufacturers for the specific use of hand engraving and impact resistance. These gravers can be ground and shaped with either a silicon carbide grinding wheel, a diamond grinding wheel or a diamond hone. When rough grinding, if the material becomes hot, DO NOT quench in water. Heat (up to 1500F) will not anneal or damage Carbalt as it does HSS, M42, or tool steel, but quenching while it is hot may cause it to become brittle causing the point of the graver to break more easily during use. Carbalt can be ground and gotten very hot on a high speed grinder like the TW Design variable high speed hone without damaging it, however, again do not quench it in water if you do get it hot. Water should be used to keep the heat down on HSS and M42 or set on a low speed with the TW Design power hone. Do this by grinding until the surface being ground becomes only warm to the touch and then dip in water. There may only be a second or two of grinding between dipping, but keep dipping in and out of the water during grinding. This will keep the graver from getting hot, assuring the material does not become damaged. 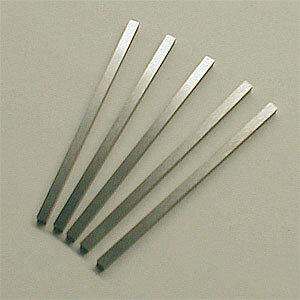 The type of grinding that builds up heat is usually done to rough the graver blank to shape. For final shaping and sharpening use a diamond lap either by hand or with a slow speed power hone which will not cause excessive heat. Graver grinding, Heat build-up and resharpening. 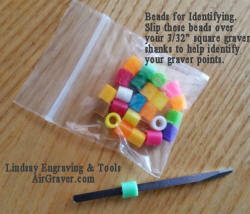 I receive questions about graver materials, heat build while grinding, reshaprening and hope this information will help. Carbalt (Carbide) can take heat more than HSS or M42. For example I sometimes make carbide tipped boring bars by brazing or silver soldering (around 1400F) a piece of Carbalt to the end of a bar. This is then used for boring an accurate I.D. in the lathe. One thing you do not want to do with carbide if you'd gotten that hot by brazing or grinding hard on a high speed grinder is quench it in water. Let the carbide air cool. A large thermal shock could damage it. I use a Tom White's (TW Design) variable speed power hone (0 to 3000rpm) for grinding at full speed for grinding the presharpened Carbalt gravers that we send out with each AirGraver purchase. These are rough ground from blank in 2 to 2.5 minutes including finishing. The finishing it done by immediately going from the high speed roughing to a 2000 grit diamond bench stone to clean up the face and place the two heels on. If I am bright cutting and want to polish the graver up further I then go to the ceramic bench stone with 50,000 grit diamond. There is no need to polish if you are engraving a gun/knife or jewelry that you plan to blacken in the engraving. On my engraving bench I just have a 2000 diamond bench stone for touching up broken or a dull point. I just keep the large template on the sharpening fixture. When the point breaks remove it from the AirGraver, place in the sharpener, rub the face 2 to 10 strokes depending how bad it is broke, then rotate the fixture over in your hand and do a stroke or two for each heel. In other words there is no need to go back to a coarser diamond stone than the 2000 or to the power hone for repairing a point. I also have 3000 diamond bench stones available. They are not on the site, but if you'd like one order a 2000 diamond bench stone and write a note in the space provided for a note when you check out that you'd like a 3000 diamond stone. Price is the same for the 2000 or 3000. The sharpening fixture, templates and diamond bench stones can be found at this link. "Sintered tungsten carbide cutting tools are very abrasion resistant and can also withstand higher temperatures than standard high speed steel tools. Carbide cutting surfaces are often used for machining through materials such as carbon steel or stainless steel, and in situations where other tools would wear away, such as high-quantity production runs. Because carbide tools maintain a sharp cutting edge better than other tools, they generally produce a better finish on parts, and their temperature resistance allows faster machining." Precautions should be taken when grinding high speed steel, tool steel, carbon steel, tungsten carbide gravers. Dust from grinding metals can cause nose, throat, skin and eye irritation and temporary or permanent respiratory disease in a small percentage of exposed individuals. 1. If using a diamond lap, coat the lap with oil or water to keep the grinding dust from becoming airborne. 3. Clean up grinding dust with wet paper towels or rags and discard of properly.